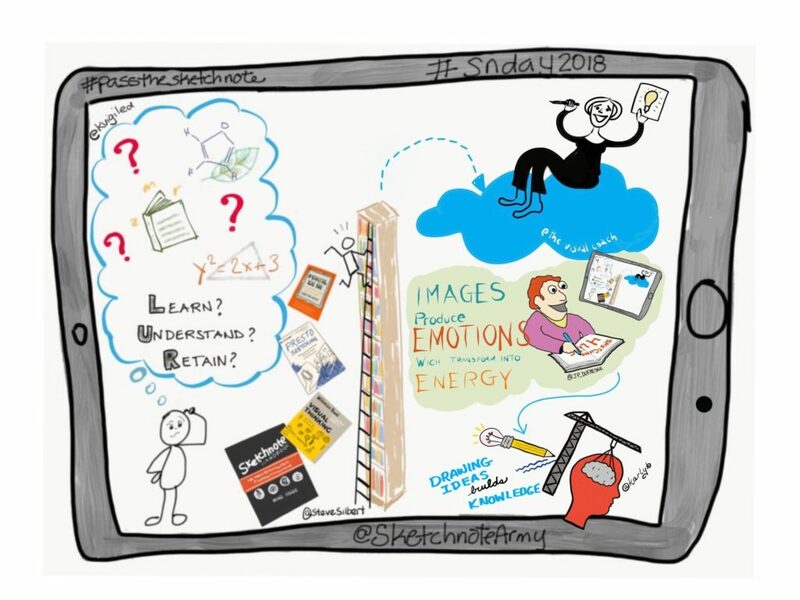 World Sketchnote Day 2018 has come and gone and what a day is was! So much happened to write about but since this is my blog I’m going to talk about things in which I was involved or were moved by. 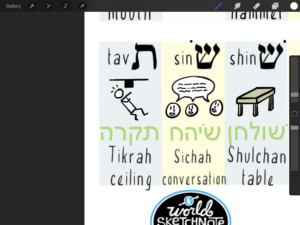 I wanted a Judaic entry into the World Sketchnote Date activity stream. So last minute I reached out to the rabbis at Bayit: Your Jewish Home and threw out an idea. 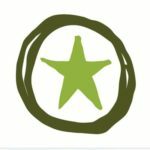 I wanted to collaborate with them on a one-day project to create a sketchnote of a Hebrew visual vocabulary. A couple of quick emails and the powerhouse Rabbi David Evan Markus, Rabbi Rachel Barenblat, Rabbi Mike Moscowitz, and Rabbi Evan Krame started a list of Hebrew words for each letter in the aleph-bet. A few iterations and I knew where their collective heads were going. They were pushing for a set of words around building and homes. Throughout the Day I posted an updated version of the sketchnote on Facebook and Twitter. Iterative development gave me quick feedback from the rabbis and many others and enabled me to rapidly build the visual vocabulary. And it was almost complete at the end of the day. I say almost because nearly as soon as I posted the final version on Facebook and Twitter I started receiving positive feedback and suggestions from a variety of rabbis and Jewish educators. On example is in the picture above where a rabbi in Israel pointed out that I had swapped two letters in the Hebrew word for “conversation.” Tweaks and changes are still happening so I’ll save sharing the finished for another post. Two really cool and innovative educators, Carrie Baughcum and Monica Spillman, came up with the idea of a game they called “Pass the Sketchnote” whereby Person 1 adds one element to the page, passes it to Person 2 who adds an element then passes it to Person 3 and so on. Their idea was to do this on a global scale. And the sketchnote community came out in force to support… well play along. People were grouped into teams of six with team members spanning the globe. And the games began! Gentle ribbing and smack-talking ensued throughout the day with a extreme anoint of encouragement. A couple of things I took away were that doing this on such a large scale allows you to see many, many different styles, tools, and personalities. The other thing was that this was a global and sketchnote version of the improve game Yes, and… confirming that the only difference between applied improv and sketchnoting is the medium of expression. Below is the finished Sketchnote for “Team 11 Digital” consisting of Mindy Woods, K. Vigil, Conni Eybisch-Klimpel, Jean-Pierre Dufrsene, and Karen Bosch. Shortly before World Sketchnote Day Mike Rohde and Mauro Toselli brought me into the fold as a co-curator of The Sketchnote Army. Throughout the day I monitored the @SketchnoteArmy notification and twitter feed, liked the most compelling, gave encouragement as often as possible, tried to connect people where necessary, and injected a touch of humor along the way. Concurrently, I did the same with my own twitter feed. Both feeds were going off the hook all day. I literally would turn my head and there would be 20+ notifications to look though. In the terms of Agile Coaching there are three levels of listening oddly labeled “Level 1”, “Level 2”, and “Level 3”. Level 1 is internal listening (listening to your inner voice over all others). Level 2 is focused listening (intently focusing on what the person in front of you is saying), and Level 3 is global listening (basically doing a continuous system scan of the world around you and taking everything in). This was Level 3 Listening on literally a global scale. It was a long day. It was a day filled with appreciation, diversity, non-judgement, caring, compassion, creativity, collaboration, connectivity, humor, ideas, innovation, and discovery. It was a great day.